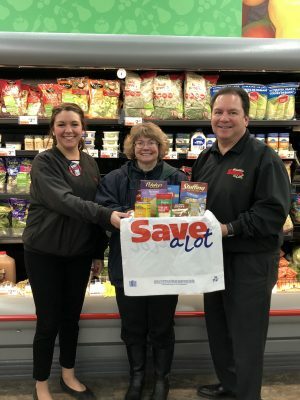 FULTON – Save-A-Lot, 364 W. First St., is partnering with Catholic Charities of Oswego County to raise money for Christmas holiday food pantry giveaways, said Mary Margaret Pekow, CCOC executive director. Whitney Mirabito, far left, and Jim Mirabito, display a bag with Susan Mayer of CCOC. As part of the Bags for a Brighter Holiday program, Save-A-Lot customers are invited to purchase a bag for $4.99 each to be donated to CCOC which will feed a local family on Christmas Day. For more information, call Pekow at 315-598-3980, ex. 223.